Gentamicin sulfate Action/Kinetics: Broad-spectrum antibiotics believed to inhibit protein synthesis by binding irreversibly to ribosomes (30S subunit). Rapidly absorbed after IM injection. Peak plasma levels, after IM: Usually 1/2—2 hr. Measurable levels persist for 8—12 hr after a single administration. tV2: 2—3 hr (increases sharply in impaired kidney function). Ranges of t1/ from 24 to 110 hr have been observed. Excreted mainly unchanged in urine. Resistance develops slowly. Uses: Are powerful antibiotics that induce serious side effects—do not use for minor infections. Gram-negative bacteria causing bone and joint infections, septicemia (including neonatal sepsis), skin and soft tissue infections (including those from burns), respiratory tract infections, postoperative infections, intra-abdominal infections (including peritonitis), UTIs. In combination with clindamy-cin for mixed aerobic-anaerobic infections. Also, see individual drugs. Used for gram-positive bacteria only when other less toxic drugs are either ineffective or contraindicated. Use in CNS Pseudomonas infections such as meningitis or ventriculitis is questionable. Contraindications: Hypersensitiv-ity to aminoglycosides, long-term therapy (except streptomycin for tuberculosis). Use with extreme caution with impaired renal function or preexisting hearing impairment. Safe use in pregnancy and during lactation not established. Special Concerns: Assess premature infants, neonates, and older clients closely as they are particularly sensitive to toxic effects. Considerable cross-allergenicity occurs among the aminoglycosides. Side Effects: Ototoxicity: Both auditory and vestibular damage have been noted. 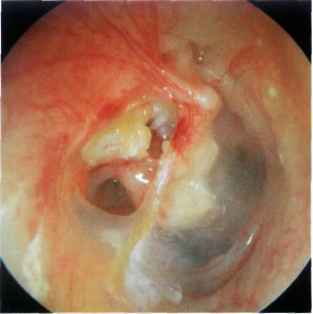 The risk of ototoxicity and vestibular impairment is increased with poor renal function and in the elderly. Auditory symptoms include tinnitus and hearing impairment, while vestibular symptoms include dizziness, nystagmus, vertigo, and ataxia.